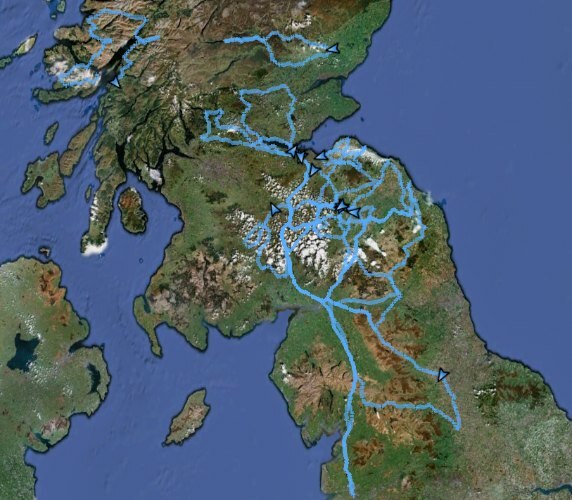 The image above shows just over 4,000 miles (6,400km) of organised riding which I’ve done over the last few years since getting a GPS. As well as being a tough challenge, good banter and all the rest, audax has obviously helped me build experience of roads that are good for long days in the saddle when it comes to planning my own days out. Because they so often intersect, these don’t have to be hero days either. The average cost for entering an audax is just £6.00, quite a contrast to the £40 or more you might pay to enter a sportive. There is also Steve Carrolls excellent rides from Portmahomack – these maybe on the pic but trimmed off. They are great rides in what often feels like a different country. Sorry, I just realised the intro was a bit ambiguous. The map is of audax rides from previous years which I have ridden, not a map of this season’s rides – I’ve clarified this. However, you have given me an awesome idea to create an interactive Audax Ecosse map to complement the calendar! Yeah I saw your map, it’s excellent. It gives you a real overview of the rides and coverage of the country as well as highlighting the busy audax corridors! . I’d like to see one or England too, out of interest.